Zomato Food Loot : Flat 50% Off Upto Rs.150 Or Rs.200 On No Minimum Purchase. 2. Create A New Account Or Login Account If Already Have. 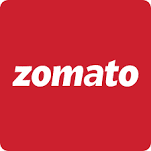 Or Use FOOD100 For New User : Rs.100 Discount + Rs.100 Cashback As Zomato Credit After Delivery. Usable 100% In Next Order. 50% Off Upto Rs. 100. *May Be Account Specific But Working For Me Kolkata. ==> You Will Get 50% Off On No Minimum Order. ==> Max Discount Is Rs.100 Or Rs.150 Or Rs.200. ==> Valid For All New User On 1st 5 Order Means 5 Times But Once Per Day For Code : NEW50 & For ZOM50 Valid Once For New User. ==> Valid Till 31st July 2018. ==> Promo Code Not Valid On Cash On Delivery Order So, Make Payment Online.